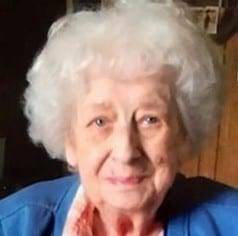 Grace Entenman, age 94, of Edgerton, Ohio, passed away at 11:30 A.M. on Tuesday, March 26, 2019, at Laurels of DeKalb in Butler, Indiana, where she was a resident. Mrs. Entenman was a graduate of Ney High School. She drove school bus for Edgerton Local Schools for many years and was the first female bus driver for the school system. She was also assistant librarian at the Edgerton Public Library for many years. Grace enjoyed making afghans, especially for her family members. Grace Entenman was born on May 1, 1924, in Convoy, Ohio, the daughter of Herman and Addie (Springer) Bartz. She married her husband of seventy-years, Arthur P. Entenman, on June 12, 1948, in Edgerton and he survives. Surviving in addition to her husband are two daughters, Judy (Donald) Pennock, of Markle, Indiana, and Kathleen (George) McNaughton, of Springfield, Vermont; one son, Marlin (Christene) Entenman, of Edgerton; fourteen grandchildren; and twenty-seven great-grandchildren. She was preceded in death by one son, Steven Entenman, in 1975; two brothers, Marlin and Doyt Bartz; and two sisters, Fern Knittle and Lela Klinker. Visitation will be held on Saturday, March 30, 2019, from 11:00 A.M. to 1:00 P.M. in the Krill Funeral Home, 114 East Hull Street, Edgerton. Services will follow at 1:00 P.M. in the Krill Funeral Home, Edgerton with Pastor Susan Kronbach officiating. Interment will be in Maple Grove Cemetery, Edgerton. Memorials are requested to the Friends of the Edgerton Public Library or St. Mary Catholic School. Be the first to comment on "Grace Entenman (1924-2019)"